The home grown automaker, Tata Motor Group is known for offering economically priced vehicles to its car enthusiasts. It has now launched the facelifted version of this model, which is available in a few trim levels. Out of these, Tata Nano XM is a mid range variant, which is equipped with a 0.6-litre petrol mill. It comes fitted with a 4-speed manual transmission gear box and enables it to achieve a maximum speed of 105 Kmph. The firm has offered it with several security aspects to ensure safety of its passengers. This list includes side intrusion beams, hazard warning switch and a few others. There are also seat belts provided, which further enhances the level of protection. What makes it look a bit different in terms of outer appearance is its infinity motif grille that looks just like a smiley. Not only this, but it also gets an integrated spoiler that makes it rear end look quite stylish. In terms of interiors, it has a spacious cabin that offers better leg and shoulder space to its four occupants. It is incorporated with well cushioned seats and has an air conditioning unit, which helps in regulating the temperature inside. Moreover, aspects such as sun visors, assist grips and cup holders are also offered for added convenience. The manufacturer has built it with an overall length, width and height of 3164mm, 1750mm (with door mirrors) and 1652mm respectively. To describe its external look, it has a wide windscreen in the front that is made of tinted glass and has two wipers fitted to it. The bonnet is quite sleek whereas, the headlight cluster is integrated with turn indicators. Another remarkable aspect is the large radiator grille, whose design is inspired by the infinity symbol. Besides these, a prominent logo of the company is also embedded, which is easily noticeable. Coming to its rear end, it has a well designed tail light cluster that surrounds the expressive boot lid, which has the firm's badge on it. The windshield comes equipped with a high mount stamp lamp, while the integrated spoiler makes its rear look trendy. On the other hand, its side profile has neatly carved wheel arches that are fitted with a set of 12 inch steel wheels, which are further covered with radial tubeless tyres. Apart from these, it includes outside rear view mirrors, black door handles as well as B-pillars. Another good thing about this small car is its appealing internal section, which is decorated with a black color scheme. The manufacturer has incorporated it with well cushioned seats that provide very good support. These seats are further covered with fine quality fabric upholstery that is in a combination of black and silver colors. It has sliders to its front seats, while the folding facility to its rear seat allows to bring in more luggage. The look of its interiors is further enhanced by premium fabrics with ebony on its door trims and silver inserts on a few of its aspects. On the other hand, its cockpit features a well designed dashboard that is equipped with two glove boxes, three spoke steering wheel and an instrument cluster, which gives out several notifications. This mid range variant has a 0.6-litre petrol engine fitted under its hood that has the ability to displace 624cc. It is incorporated with a multi point fuel injection system and has two cylinders. This motor is based on a single overhead camshaft valve configuration. It has the ability to produce a maximum power of 37.5bhp ranging between 5200 and 5500rpm, and delivers 51Nm torque between 3500 and 4000rpm. 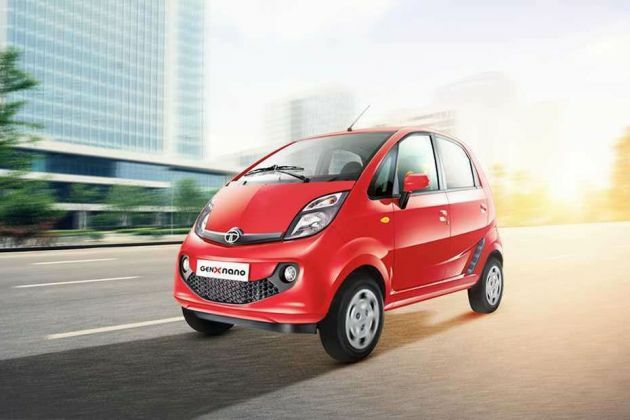 It gives a fuel economy of about 23.9 Kmpl on the highways, which comes down to around 20.4 Kmpl within the city. The firm has skillfully coupled it with a four speed manual transmission gear box. This hatchback comes with a reliable independent dual circuit hydraulic braking system featuring tandem master cylinder with a vacuum booster. The car maker has equipped both its front as well as rear wheels with sturdy drum brakes. In terms of suspension, its front axle is assembled with an independent, lower wishbone McPherson strut, while the rear one is affixed with a semi trailing arm. This trim is also bestowed with an electric power assisted steering system that comes with active return feature. It enables easy maneuverability and supports a turning radius of 4-meters. A number of comfort features are present in this small car, which makes the journey quite comfortable for its passengers. It comes with a driver information display, which gives updates to the driver about the vehicle. The dashboard is equipped with dual glove boxes, which further adds to the utility value. The front windscreen is integrated with wiper that also includes washer function. The cabin is installed with a proficient air conditioning unit that allows its occupants to set the temperature as required. There is also a provision for including a 12V power socket using which, mobile phones can be charged. It comes with boot compartment of about 110 litres that is pretty good for placing enough luggage inside. Other aspects such as cup holders in the front console, electronic tripmeter, digital clock, front sunvisors, assist grips, low fuel warning indicator, driver as well as front passenger seats with sliders and a few other features that gives additional comfort. In order to keep its occupants safe, the automaker has loaded it with a few, but important safety features, which ensures high level of protection. This list includes a centrally high mounted stop lamp, which is integrated to its rear windscreen, while all the passengers are provided with seat belts. The impact cushioning crumple zones as well as side intrusion beams further helps in minimizing injuries in case of an accident. Besides these, this trim also has booster assisted brakes and hazard warning switch as well. 1. Spacious internal section with comfortable seating arrangement. 2. Fuel economy is rather satisfactory. 1. More interesting exterior aspects can be added. 2. Safety standards need to improve. Tata Nano is available in 6 different colours - Damson Purple, Sangria red, Meteor Silver, Pearl White, Espresso Brown, Dazzle Blue.